Since it's cold, I have been drinking a lot of coffee, but I get tired of the same old thing. Enter the cocktail. 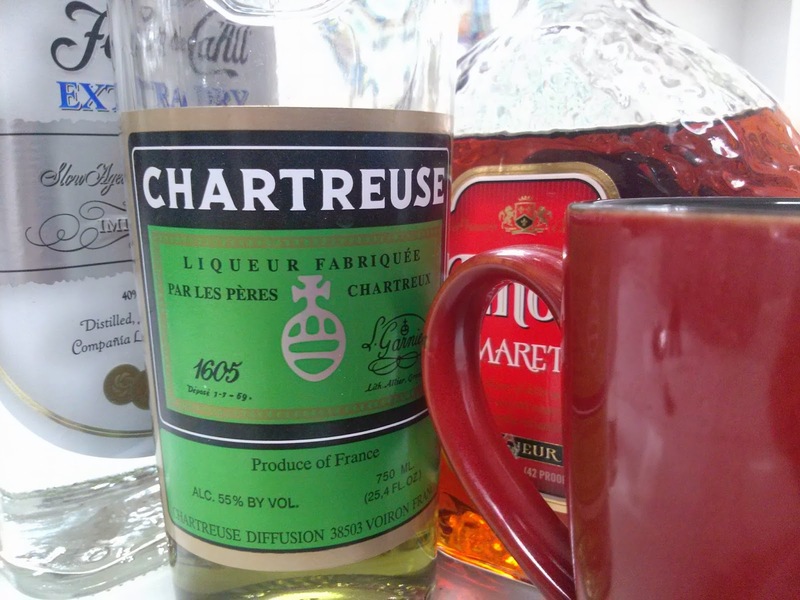 After drinking a few Cafe Royals, I knew that coffee and Chartreuse went well to together, so I decided to do some experimenting and came up with a delightful concoction I call The Morning After. You will know when you need it, trust me. and fill with hot coffee. You can even put an ounce of milk or half and half to make it creamy. Stir, and enjoy. It's sweet and herbaceous, and even quite strong. Two ounces of alcohol in a mug of coffee is pretty stout. So be careful. When it's the morning after, you will want one.